Innocence isn’t awful and is passable entertainment but it’s the latest in the ‘tween vampire trend that began with Twilight. 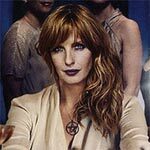 The acting is OK headlined by Kelly Reilly as the main villain and Sophie Curtis for her part wasn’t half bad the lead actress. Fans of this genre (or subgenre) might get something out of it, for others it’s destined for the Wal-Mart dump bin.